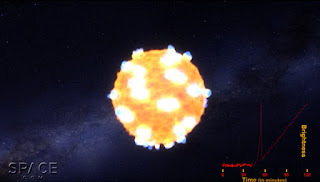 A supernova is an astronomical event that occurs during the last stellar evolutionary stages of a massive star's life, whose dramatic and catastrophic destruction is marked by one final titanic explosion. A star named KSN 2011d, with a diameter nearly 500 times of the sun and is located about 1.2 billion light-years away, came into the National Aeronautics and Space Administration’s (NASA) planet-hunting Kepler Space Telescope's view last 2011. The Kepler Space Telescope is designed to find planets outside Earth's solar system and was gazing continuously at a point in the Cygnus constellation when it got wind of the star that ended its life as a supernova. NASA said that it was "an investigative milestone for astronomers" as it was the first time scientists had seen the shock wave emanating from a massive star explosion in visible light.